Runtime: 146 min Rated PG in Canada. 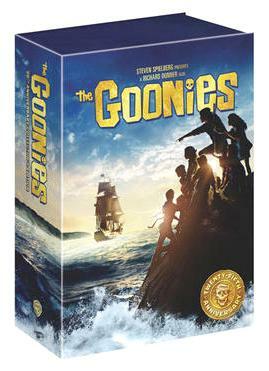 At dinner I said to my wife, “I saw something for my Christmas list … there’s a 25th anniversary Blue-ray edition of the Goonies.” She said it made her feel old. A half-hour later we were sitting in the movie theatre waiting for the new Harry Potter movie to start and, looking around I saw we were maybe the oldest people in the theatre at 35. I said that made me feel old. This was somehow fitting considering the themes in the film. 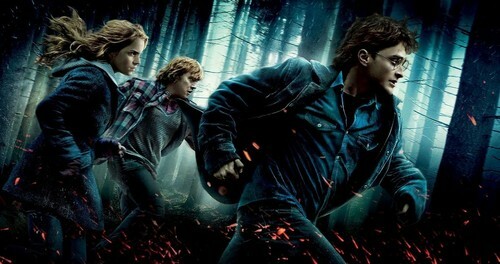 A generation has grown up with Harry Potter, reading the books and watching the films. If you were 10 years old in 1997 when Harry Potter and the Philosopher’s Stone stormed the theatres and you sat in the theatre Saturday night of opening weekend with my wife and I watching Harry Potter and the Deathly Hallows Part Onethen you would be around 23 years old, on the cusp of adulthood; although these days no one seems to grow up until they’re in their 30s. If you haven’t read the book upon which the current Harry Potter film is based and if you haven’t watched the film, you may want to stop now because spoilers lay ahead. There’s a lot jammed into the film but the central theme, even more so than in the previous films, is the theme of growing up. In this film there seems to be a sort of fear of ageing, trepidation in every step towards it; the adult world is full of darkness and trouble. There’s even an underlying resentment of the responsibilities thrust upon the characters. Curiously, however, the adult world has always been in the films, it’s the maturing process of the children that reveals that world to Harry, Hermione and Ron over time. The past seems to catch up with them even as they run towards the future; toward their goal. This is all wrapped up in angst. The villains are significantly older than the central heroes and the truly aged are generally seen as frightening, as can be seen in the visage of the old woman in Harry’s hometown who in truth harboured an agent of Voldemort, the serpent Nagini. At one point, while fighting the serpent, Harry is pressed into a child’s room, brightly lit and coloured, highlighting the forced abandonment of childhood by the work of evil around him. Even happy events associated with ageing, like the marriage of Ron’s older brother, are interrupted and marred with the presence of evil: an evil that threatens to keep friends apart and brings death and harm. The starkest example of this is found in the death of Dobby the house-elf at the hand of Bellatrix Lestrange as Dobby rescues Harry and his friends from the clutches of the enemy. 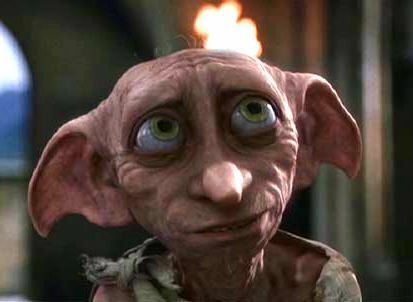 This is significant because Dobby first appeared in Harry Potter and the Chamber of Secretswhen the children were still fresh-faced and filled with joy and adventure: at Dobby’s death there’s a sense that a lot of that joy and adventure died with Dobby, even more so than at the death of Dumbledore in the conclusion of Harry Potter and the Half-Blood Prince. There is a contrast between the two deaths and their treatment in the two films. At Dumbledore’s death loyal students and teachers raised their wand in tribute reminiscent of people who show their appreciation at concerts with their lighter (old fashioned) or cell phones (new fashioned). While this was intended to be emotional and heartbreaking the more intimate and more touching is the scene in Harry Potter and the Deathly Hallows Part Onein which Luna and Harry close the dead Dobby’s eyes; where Dobby’s little body is buried by hand (with no magic) at the insistence of Harry who feels yet again responsible for the deaths surrounding him. Entwined into the plot of the film is the film’s namesake “the Deathly Hallows,” the title of a children’s fairy tale, in the magic world, bequeathed to Harry’s friend Hermione by the late Hogwarts Headmaster Dumbledore. The fairy tale “the Deathly Hallows” is found in an elementary reader The Tales of Beedle the Bard which Ron Weasley remembers fondly along with other fairy tales from the book. This seemingly innocent fairy tale, an emblem of childhood, however is a portent of things to come. Within the context of the film it’s a fairy tale that’s true and because of this as the film unfolds there appears nowhere for our characters to turn for relief—not childhood, not anywhere, even a light moment of dancing in their tent can’t cheer them up. Adulthood, responsibility and maturity have them pinned against the wall … it would almost appear that the very fairy tale character of ‘Death’ from “the Deathly Hallows” has come alive and is in hot pursuit. Death as an adult concern surfaces strongly in this film. 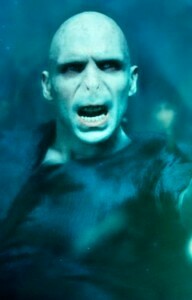 Voldermort’s name has a play on the word death in it; His followers are even called death eaters. From the first film onward the evil dark lord, who ‘must not be named,’ has been coming back from “the dead,” growing in strength. Yet there’s a catch. The mystery of his return is detailed more fully in this film: Voldemort has hidden his soul away in objects and things to evade death. He split his soul into little parts and spread them around in Horcruxes, talismans that must be destroyed to destroy him. This may not be a conscious question, but bear with me; Do you think the world values the soul? Do you value your soul? Do others value your soul? Does it feel like it’s broken into little pieces? Are you struggling in a world full of darkness and trouble? Are you struggling with deep questions like this while the world distracts itself with “Dancing with the Stars” and “America’s Got Talent!”? Even though this film is based on a work of literary fiction do you wish you had a place where you could talk about the feelings and ideas it brings up? Somewhere your soul is not fictional but real; where ageing, growing up, responsibilities and stalwartness need not be scary but rather imbued with joy and adventure—a place where your battered, broken soul can be repaired and put back together again? There is a place like that, a real place, where a real hero fought and conquered death and evil with self sacrifice and love: it’s the Kingdom of God and Christ Jesus is the King, He is the Hero and He is the same yesterday, today and forever. He crushes the serpent’s head and brings eternal life to the body and the soul no matter what your age.